Funny maternity shirts are one of the hottest maternity fashion trends. Perfect for lounging around the house, running errands, or shopping with friends, these cute t-shirts are a casual wardrobe staple. Pair them with some designer maternity jeans and you've got an instant outfit! 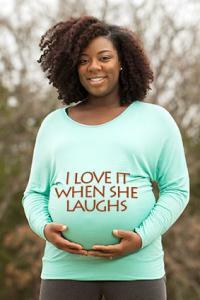 While some maternity stores carry a selection of funny maternity shirts, shopping online gives you the most options. Whether you're purchasing a shirt for yourself or for a pregnant friend, maternity boutique websites make it easy to find the perfect maternity t-shirt. Got baby! also offers humorous designs for the dad-to-be, including several variations of He Shoots. He Scores and My Boys Can Swim. 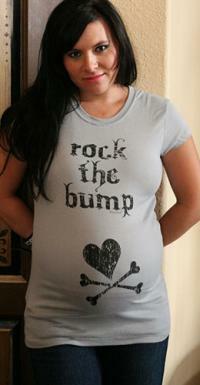 Stella Maternity offers funny maternity shirts for the seriously cool pregnant chic. 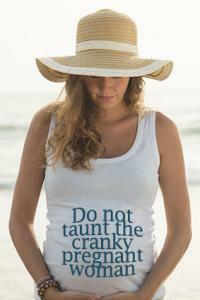 These shirts make great gifts for an expecting mom. No genius, I'm not pregnant. I swallowed a bowling ball. If that's my family I hear out there, I'm not coming out. Each pregnancy is unique and you have a great opportunity to put your creativity to work. Spending some time developing your personalized pregnancy slogan lets you consider your experience. The baby's perspective is a great point of view to consider. There are many cute things your baby can say to everyone you meet. Being a first time mom is in experience that comes with many surprises. Brainstorm with your partner to develop funny or sentimental sayings for you to wear. Seasoned mothers have a great opportunity to show their sense of humor along with their sense of style. Inspirational moments can pass by very quickly. Some are warm and endearing while others might be too personal to share on a maternity t-shirt. Be open to inspiration, and keep a notebook handy to jot down your ideas for maternity shirts with sayings. Generally, you order maternity shirts in your pre-pregnancy size. If you wore a medium before you became pregnant, you would order a medium in your maternity clothes unless your pregnancy weight gain is much more than the recommended 25-35 pounds. While some maternity stores will allow you to return items that were purchased in the wrong size, others don't allow returns or exchanges. Always ask about the return policy before making your final purchase. If you're worried about shrinking t-shirts, look for pre-shrunk cotton shirts or take care to follow the manufacturer's cleaning instructions. Most cotton fabric shrinkage will occur during the first wash.